Toenail fungus—also called onychomycosis or tinea unguium—is an infection below the surface of the nail caused by contact with different types of fungi. Nail fungus usually begins with white or yellow spots under the tip of the toenails. If left untreated, the infection can grow deeper, which can cause the nail to become weak or brittle to the point that it eventually falls off. Distal subungual onychomycosis (DSO): This is the most commonly diagnosed and treated fungal infection. Also known as Athlete’s Foot, this infection spreads across the nail bed, which causes the nail to become discolored and weak. White superficial onychomycosis (WSO): Far less common than Athlete’s Foot, WSO causes white patches to appear across the entire nail. Candida onychomycosis: This chronic fungus is usually caused by trauma, and it causes the toenails to become bulbous or enlarged. Proximal subungual onychomycosis (PSO): This fungal infection causes yellow or white spots to appear near the base of the toenail. How are Fungal Nail Infections Treated? Treatment isn’t always necessary—depending on the severity of your condition—but it is recommended simply because it might be contagious. Not only can you spread the condition to someone else, but depending on the type of fungus, can also spread to infect your other toes. 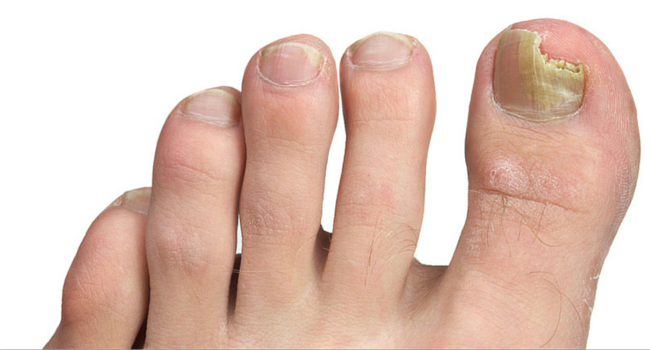 For mild cases of toenail fungus, your doctor will likely start with conservative treatments. These may include prescription anti-fungal oral medications or topical solutions. For patients who exhibit severe symptoms—or for those who do not respond to medication—the doctor may recommend nail avulsion surgery. During this procedure, the nail plate is removed and chemical treatments are introduced to treat the infection. Contact your podiatrist for more information or to schedule a consultation.